A late afternoon rain gently pattered down on my umbrella as we walked along a tree-shaded path in northwest Kyoto. The light was dim, the day’s last remaining sunlight unable to break through the clouds. The further along the path we got, the faster I walked, eager to see one of Kyoto’s most famous sites. The anticipation abruptly came to a halt when I turned a corner and the path opened up into a garden, revealing Kinkaku-ji Temple. What I saw literally made my mouth drop. “Wow!” I exclaimed to no one in particular, but loud enough for those around me to hear. The Golden Pavilion shone surprisingly bright under the gray sky. I wasn’t expecting it to be that gold! I would have stopped in my tracks if I weren’t so excited to take pictures of this shimmering masterpiece, reflecting perfectly in the pond before it. Kinkaku-ji Temple, in all its glimmering glory, stands as a legacy of medieval Japan. The Golden Pavilion, as it’s commonly known, was originally built in 1397 by the third Ashikaga shogun, Yoshimitsu. 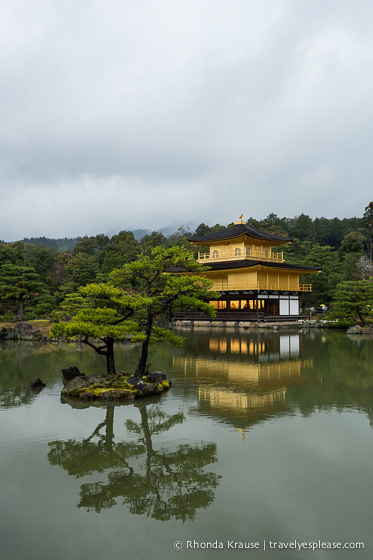 The Golden Pavilion served as part of Yoshimitsu’s retirement villa until his death in 1408. As per Yoshimitsu’s will, the complex was then converted into a Zen Buddhist temple. Unfortunately, the temple you see today is not original. Kinkaku-ji burned down twice during the Onin Civil War and most recently in 1950 when it was destroyed by arson, apparently by a fanatic monk. An exact replica of Kinkaku-ji was built to replace it in 1955. In 1994, Kinkaku-ji Temple was registered as a World Heritage Site as part of the Historic Monuments of Ancient Kyoto. Kinkaku-ji Temple’s most obvious appeal is the gold leaf that completely covers the top two levels of the three-story structure. Yet, if you look beyond that, you’ll notice that each floor is built in a different style of architecture. The first level is quite understated and natural, compared to the two floors above it. Built in the Shinden style popular during the Heian Period, the main floor consists of wooden pillars and white plaster walls. The second story incorporates the Bukke style of architecture, which was commonly used in samurai homes. Lastly, the third level is reminiscent of a Chinese Zen Hall. It is gilded both inside and out, and is topped with a golden phoenix ornament. We planned to visit Kinkaku-ji just before closing because I had read it gets extremely crowded with people. Even on a rainy day, late in the afternoon the viewing area was still packed with visitors. I can only imagine how busy it must get mid-day when the weather is nice! I found that taking pictures here was quite the challenge. I had to push my way past selfie-stick wielding tourists to get to the front of the group where the railing was. My next mission was finding a spot where there were no tree branches hanging down into the frame. So I waited and waited, until I’d see a small spot open up then I would fit myself into it and stand my ground. Eventually I found a composition I liked. Even though our experience of visiting this temple was somewhat contradictory to the peaceful scene you see in photos, I still really enjoyed Kinkaku-ji. I thought it was one of the most beautiful places in Kyoto. The temple itself is very unique- way more lavish than other temples we visited during our 2 weeks in Japan. We spent a lot of time just standing there in the crowd, captivated by the Golden Pavilion. The temple’s reflection, and that of the surrounding trees, was mesmerizing, somehow even distracting me from the mass tourism that surrounded us. All I kept thinking was, this is a perfect scene. Everything just fit together so nicely- the small islands of trees, the lush green hills in the background, the reflections off the pond, the architecture of the temple. It all effortlessly came together to create a powerful, impressive landscape. Kinkaku-ji Temple is open daily from 9:00 am- 5:00 pm. Visit early in the morning or just before closing to try and avoid most the crowds. Admission to Kinkau-ji costs 400 yen. Kinkaku-ji Temple can be reached by city bus or a combination of subway and bus. To make it easier, and get there faster, we took a cab. The interior of the Golden Pavilion is not open to the public. However, from across the pond you can get a glimpse of some of the statues stored on the first floor. Frank - Beautiful photos, looks very tranquil – wouldn’t know you had to fight off a bunch of tourists and their selfie sticks. Isn’t that the way of the world now? patrick - Yes, too bad is always so crowded. I agree, go early in the morning. Still, is a great sight!